A series of linear depressions collectively referred to as the Central Depression can be traced along the middle of the island core trending in north-northeast to south-southwest directions (fig. Central Depression wetlands). Ground Penetrating Radar (GPR) investigations in the Central Depression reveal local subsurface features that have a synformal cross-sectional profiles. 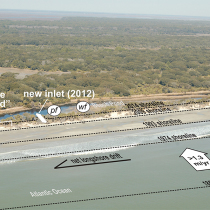 The features are tentatively interpreted as sag structures that are the surface expressions of subsurface dissolution in the Eocene carbonates that comprise the upper Floridan aquifer system (Vance et al, 2011). Numerous Late Archaic archaeological sites flank the Central Depression, and historical accounts describe spring-fed meadows and streams originating from the area (Hayes and Thomas, 2008). Palynological investigations of a vibracore sample extracted from a remnant freshwater marsh support the former existence of these surface depressions as open freshwater wetlands (Ferguson et al., 2010). At the turn of the 19th century, artesian wells located on the island had hydraulic heads approximately 45 feet above land surface; however, the current Floridan aquifer potentiometric surface is located 15 to 35 feet below land surface (Reichard et al., 2014). 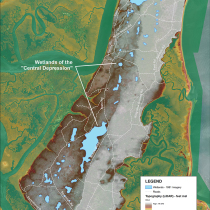 Vento and Stahlman (2011) have led investigations into the soil and sediments that occur in the Central Depression and in exposures located on the eastern portion of the island. 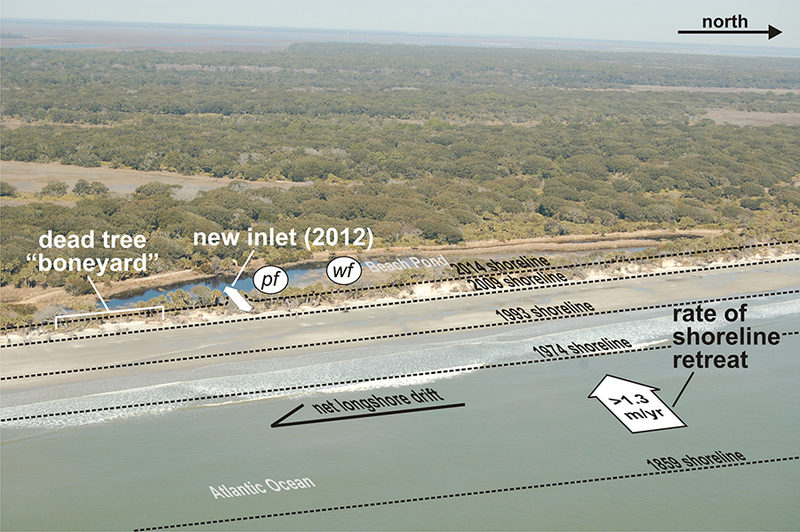 The framework for the wetlands was established by the progradation of beach ridges, forming swales that were subsequently flooded by rising sea level during the Late Holocene. Beach Pond was transformed into a palustrine environment due to the emplacement of a washover fan attributed to the Great Sea Islands Hurricane of 1893. 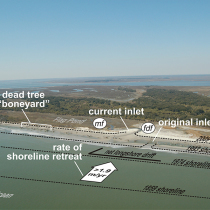 Shoreline retreat resulted in Beach Pond becoming an intertidal sand flat in May 2012 (fig. “beach pond env change”). Flag Pond is an intertidal marsh that was formerly a palustrine wetland that underwent a transition to an intertidal wetland as the result of shoreline retreat and the “Storm of the Century” in the spring of 1993 (fig. “flag pond env change”). 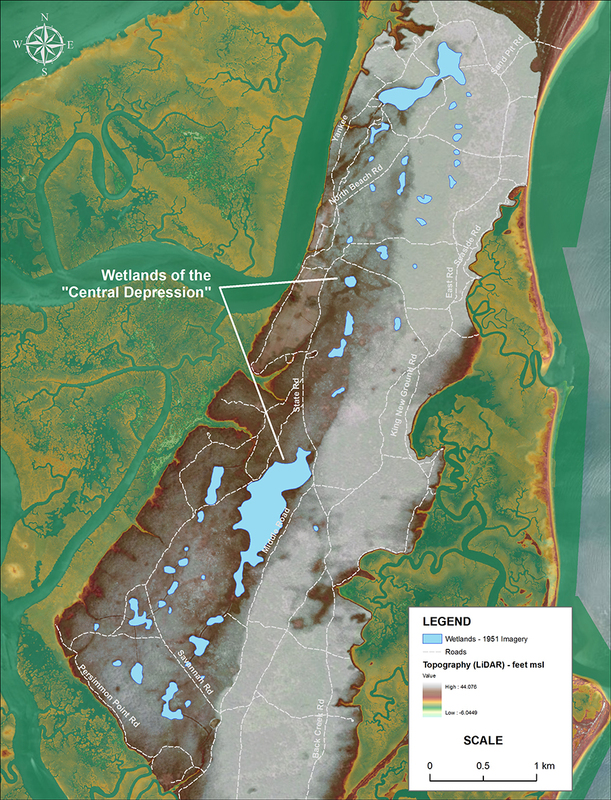 The dramatic changes in the nature of the wetlands due to sea level rise and shoreline retreat are best observed using an animation of historical aerial photographs and images. 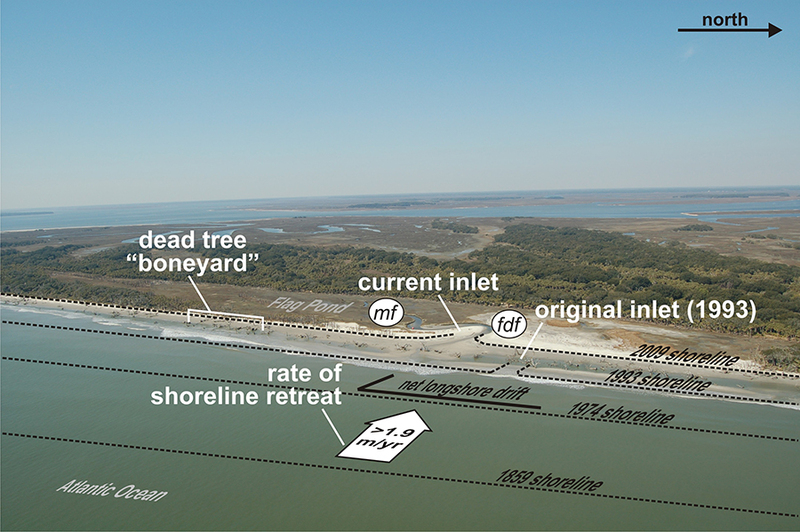 Note how shoreline retreat culminates in the erosion of the eastern berm of Beach Pond and the conversion of the freshwater wetland to an intertidal environment. Rich, F.J., R.K. Vance, and C.R. Rucker, 2014 The palynology of Upper Pleistocene and Holocene sediments from the eastern shoreline and Central Depression of St. Catherines Island, Georgia, U.S.A: Palynology 38(2): p.